I've been standing at my kitchen table with hot water in hand for the past hour just watching it rain. Lost deep in thought about everything and nothing. Savoring silence and stillness and a bit of solitude after a long work week. Posting this feels like such an accomplishment. I had big plans for this space in January. New series, new webinars, fresh recipes, regular posts. Instead I quite unintentionally and certainly unexpectedly ended up taking a bit of a sabbatical. From here. From Instagram. From everywhere. Instead I went back to work (the paid kind in food styling) and over the course of the past month I've been slowly falling in love with it again. For a long time, maybe always, I've had this issue of taking on too much. Divided attention. Too many balls in the air. There's even a term for it now that paints it in a positive and (if you're worth your weight in digital salt) sustainable light: the multi-hyphenated millennial woman. Gross, I know. I liked the way that sounded as much as the next girl run ragged though and pounded that Kool-Aid until I was quite literally sick. Turns out what has always appeared on the surface to be a healthy and stimulating mix of interests is actually just an anxiety-driving, quality-diluting lack of focus. And it had a pretty detrimental affect on the peace of my soul last year. Not to mention the pretty stagnant and defeating feeling of mediocrity from rarely living up to my own expectations in all these pursuits. No one can crush everything all the time and there's only so much time in a day. For some reason I thought I was superhuman. One of my favorite verses says, "Whatever your hand finds to do, do it with all your might." Learn a craft. Master it. Dedicate yourself to it. There is a deeper, richer satisfaction to be had in the full immersion and commitment to one thing than can ever be found in the partial pursuit of everything. I've found this true of relationships too. If you're going for depth you can really only invest in so many at one time at any given point in your life. Another post for another time. In any case, with the latter you just end up spinning your wheels and making very little progress overall. It's exactly why at the end of last year I just felt...tired. I blamed it on all kinds of things including the city itself. But truly I had just worn myself thin from a lack of focus. I was working on everything and therefore I was working on nothing. For a long time I found this idea of a one-track focus limiting. What about all the other things that so genuinely stir my soul, peak my curiosity, or challenge an entirely different part of my brain? Like ballet, writing, the making of grandiose wedding cakes, coding (for real), knitting, photography, an enduring fascination with macroeconomics and things that are still only one-day status like learning to play the piano and speak French at a conversational level. All these things are just supposed to be left behind? Interests and hobbies and side hustles are great. Necessary even. But 10 side hustles? Really? All that to say, lately I've been seeing this idea of a single focus in a new light. Not as stifling but as a different kind of freedom. I'd also venture to say that my blood pressure is likely significantly lower, my anxiety down several notches, and my sleep patterns a lot sounder. I was uncharacteristically discouraged coming into 2017. What difference does one day to the next truly matter? But in the few short weeks of 2017 thus far, in this unanticipated sabbatical from every expectation I'd heaped onto my own plate, the life that was feeling too frantic to sustain, stale, and decidedly grey somehow feels different. Hope crept in. And not only that, it seems to be sticking around. Somewhat subconsciously I exchanged the expectation to produce for the freedom to rest. I exchanged a laundry list of resolutions for one simple word that I hope will guide and define the year. And I've done my best to fix my eyes on what lies in front of me and not on every other option and possibility that lies beyond it, in a way coming to terms with my own ability to create either heaven or hell out of my own circumstances. So I'm slowing down. Taking on less. Narrowing my focus. Warming up to the idea of mastering one craft. This whole idea of mastery, of refining and respecting your craft characterizes the art of cooking. It's why I'm enamored with watching professional cooks do their thing. The best seat in the restaurant is always at the chef's table or the bar that is perched over the open kitchen prep area. You're essentially witnessing a silent, seamlessly conducted edible symphony unfold before your eyes. It's even more so why I love pastry, bread making and my favorite cross between the two, viennoiserie (which is what this recipe is.) All three of which, I think, require more precision and an even broader respect for technique than savory cooking. The romantic art of bread making demands time and the realization and understanding that bread is a living, breathing thing highly sensitive to its environment requiring food, oxygen, and hydration in delicate balance just like us. I'm so thoroughly captivated by it. Taking on a bread baking project is a labor of love that is just as much about the process than it is the final product. There are short cut and cheat's recipes but those just don't seem right. My favorite kind of bread and viennoiserie recipes require that you immerse yourself in their production for at least a day if not several. Some recipes require several months of advance planning. Dedication, patience, commitment. All things I've been lacking the past year when it comes to work, the city, life in general. To return to them wholeheartedly I think can mean a very different year ahead than the one I just left behind. I remember the first time I saw a Pain d'Epi. I was at Thomas Keller's famed Bouchon restaurant in Yountville just outside of Napa. We obsessed over the cookbook in culinary school. It'd just come out. I never imagined I'd find myself living just 40 minutes away from it less than a year later. If you've never been it's the most magical French bistro. So refined. Equally humble and ornate in personality. Like old distinguished money with nothing to prove and an effortless confidence in it's enduring place in the dining world. It's consistency is unwavering and the food is rich and comforting. The type of classic flavors and textures you truly crave. I just love it. The tables are covered in crisp paper and to start, a Pain d'Epi with just enough leaves to satisfy everyone at the table is placed directly on it accompanied by a ramekin of smooth salty butter. The first time you see it you're like, "Um....this is the most beautiful and graceful edible thing I've ever seen. Is this bread? Why does it have leaves? How? Actually it doesn't matter. Thank you. For this. I LOVE food." Something like that. Little culinary nerd mind blown. 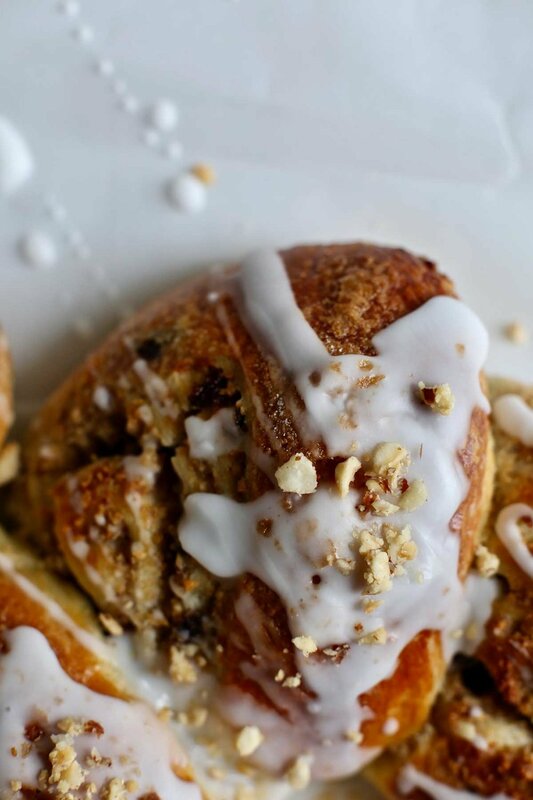 Here this same delicate bread shaping technique is applied to a sophisticated riff on cinnamon rolls. 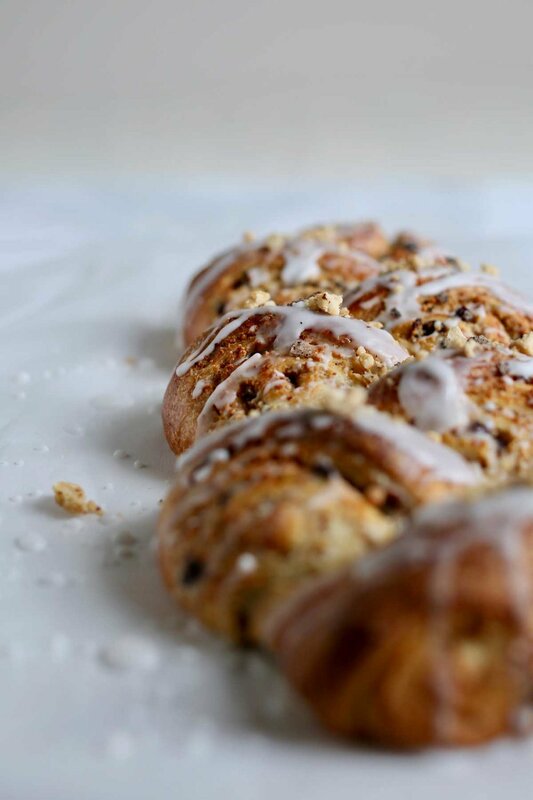 I originally set out to make this circular Swedish Epi coffee cake ring thing. Suffice it to say I should have used all of my dough as opposed to dividing it in half like the directions called for but that's neither here nor there. This is where we landed and now that we're here, I think I prefer it. The genius in an Epi is that there's no slicing required. It's pre-portioned by design. And turns out it's not actually all that tricky to re-create. Just a few snips with your scissors and that's it. 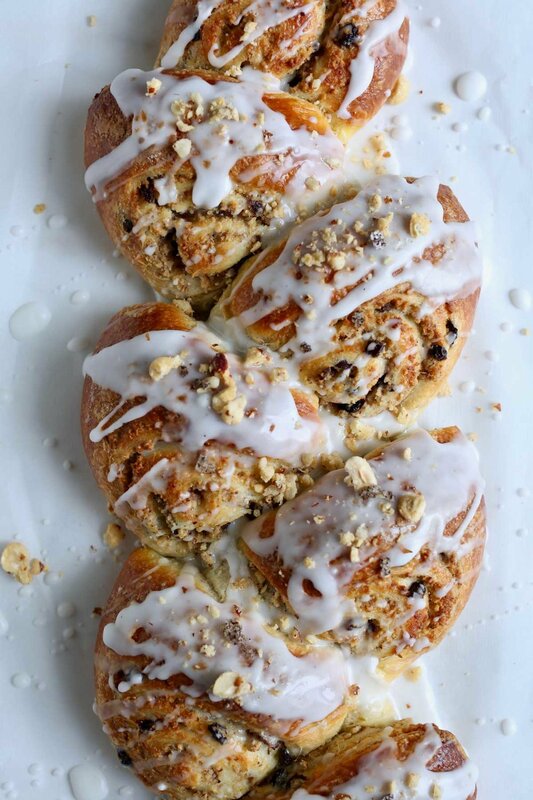 This pastry is crisp on the outside and soft and pillowy on the inside with just a hint of sweetness (this is where the icing comes in) from the currants folded into the hazelnut filling. And so for the first post of 2017, just before the first month of it slips away, a recipe that shows just how rewarding the fruit of patience, focus, and commitment can truly be. Place the butter on a clean, lightly floured work surface and sprinkle with 2 tablespoons flour. Beat with a rolling pin and turn over onto itself with a bench scraper. Work remaining flour into the butter until you have a smooth, malleable mass. Try and work quickly to avoid overheating the butter. Shape into a 8 x 5 inch rectangle, wrap tightly in plastic and transfer to the refrigerator. In the small measuring cup combine the milk, yeast, and 1 tablespoon sugar and let stand until foamy, about 5 minutes. In the bowl of a food processor pulse together the flour, remaining 2 tablespoons of sugar, salt, and tablespoon of butter. Pour in the yeast mixture and pulse 2-3 times. Beat together the egg and yolk and add it to the processor. Pulse until dough just comes together. Turn out onto a well floured work surface and knead for a few turns working in additional flour to prevent sticking until smooth, 10-12 kneads. Cover and let rest for 5 minutes. Clean and re-flour the work surface. Roll the dough into a 14 x 8 inch rectangle with the short end facing you. Remove the beurrage from the fridge and place it on the top two thirds of the dough leaving a 1 inch border on the top and sides. Fold the bottom third of the dough up over the butter and fold the top third (with butter on it) down like you're folding a letter. Seal the edges to encase the butter and rotate the dough so that the short end is facing you with the folded edge on the left and the sealed edge on the right. Flour the dough again and roll to a 16 x 8 inch rectangle. Fold the bottom third up and the top third down again. (This is a single turn). Repeat this process once more rotating so that the short end is facing you with the folded edge on the left and folding into thirds. Wrap loosely in plastic and refrigerate for 30 minutes. Remove dough from the fridge and repeat the process above giving the dough two more turns. Refrigerate for another 30 minutes. Give the dough one additional turn and refrigerate for a final 30 minutes before filling and rolling. You can also freeze the dough for future use at this point. To make the filling, cover the currants with very hot water for 5 minutes to soften. Pulse together remaining ingredients in a food processor thinning with milk until you have a spreadable consistency. Drain currants and add to hazelnut mixture stirring to combine. Preheat the oven to 400 degrees. To assemble, divide the dough in half wrapping one portion for later use. Flour a work surface and roll remaining half to a rectangle just under 1/4 inch thick approximately 8 x 16 inches with the long side closest to you. Gently spread filling over dough to edges and roll up the dough. Transfer to a baking sheet lined with parchment paper seam-side down. Using a sharp pair of kitchen shears make perpendicular cuts into the dough almost all the way through 1 1/2 - 2 inches apart. Gently pull each newly cut roll to opposite sides. Cover loosely with lightly oiled plastic wrap or with a clean kitchen towel and let rise in a warm place until nearly doubled in size, approximately 30 minutes. While the dough rises whisk together the egg wash and set aside. Brush dough with egg wash (try and avoid the open filling) and sprinkle with sugar. Transfer to the preheated oven and bake for 25-30 minutes or until deep golden brown. 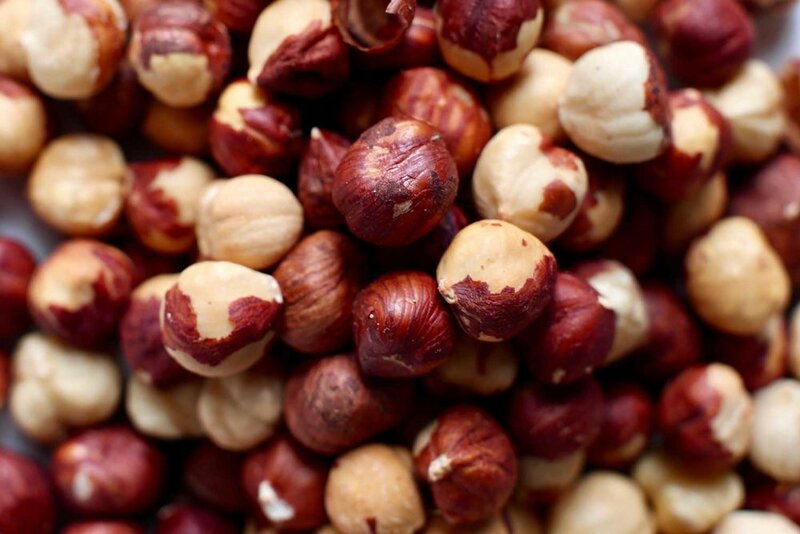 While the Epi bakes whisk together the ingredients for the glaze and chop the hazelnuts. Once the pastry is barely warm to the touch drizzle with glaze and sprinkle with hazelnuts and a pinch of finishing salt.